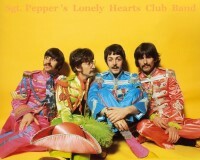 A drawing of Sgt Pepper Beatles will arrive soon! 2 to 4 days, depending on how much homework I have. Can't wait for your next piece, @Getbackintheussr! Awwww I really love your drawing style GB! Can barely wait to see more! Yayayayayayayayayay!!!! this is so very exciting, can't wait for more! Amazing! I love the way you captured his facial expression and George-ness. Thanks everyone! I really, really appreciate it. Okay, I finally finished my Sgt Pepper drawing, done in pen. I severely underestimated how long it would take, so I had to cut out some parts to make it easier. But overall, I'm really proud of it. Oh, and constructive criticism is always welcome, even if you aren't an artist! Jesus that's intricate! Well done! If I had any constructive criticism it's that George's nose isnt exactly perpendicular with his mouth, but that's pure nitpicking! WOW That's really a fine piece of art @Getbackintheussr , you can catch the details on their clothes so accurately! That's the shadow on Paul's face, but yeah, it does look weird now that I see it. Anyway, thanks Holey and Scarlett! ahhhhhhhhhhhhhhh that is SO GOOD, GB, SO GOOD! Awesome!!! Will you be taking requests? Whoa. @Getbackintheussr, that does indeed look like a time-consuming piece of art. I don't have anything much to say other than I dig your style, the combination of detail and quirkiness. 11/10. @QuarryMan I might be able to, but I'll be busy for the next 2 months. I love this style @Getbackintheussr, especially the way you've done Ringo! Looks like it could have been a panel taken out of a graphic novel! Would love to see you draw more like this. Wow! I know this has already been said, but the detail on their pepper-suits is amazing! I'd love to see more.